Whole home surge protection can help prevent damage from your electrical devices or, worse yet, your entire electrical system. Protecting your home and all the electronic devices you rely on from electrical surges is even more important as the winter months approach. Severe weather can do serious damage to your home’s electrical system, as well as your electronic appliances and devices. As the seasons change and your electrical system faces new demands, consider an electrical safety inspection and whole home surge protection as ways to keep your home prepared for whatever challenges you’ll face during the winter. Whole home surge protection can be a great way to protect your home from power surges and other electrical issues. During the winter, power surges become more common. This is because power lines often become damaged by ice, snow, and accidents, and increased heat consumption can result in more frequent blackouts. The repairs to power lines damaged by stormy winter weather can cause power spikes that can damage the electronics in your home. This is where surge protection comes in. Surge protection diverts excess voltage into the ground, preventing overloads of your appliances and wiring. An electrical safety inspection can help you determine how well your home is grounded to properly protect it from power surges. To ensure that your home is safely grounded and outfitted with surge protection to prevent damages or electrical safety issues for your family, call TriStar Electric today! One of the best ways to prevent power surge issues is through whole home surge protection. You may have outfitted many outlets in your home with individual surge protectors and power strip surge protectors in order to prevent device damage, ensure data backups in case of power outages, and even to save energy. But those devices wear out a lot faster than we think they do. Whole home surge protection provides an additional layer of protection that can make all the difference in the winter. This can mean surge protection between the power lines and your home’s electrical system, or between the electrical meter and your breaker box, to ensure your whole home is protected during a power surge, not just individual outlets. 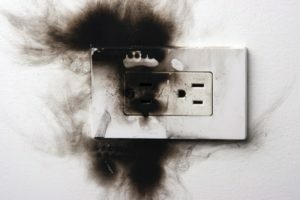 The damages during a power surge can really add up: think about the cost of replacing your television, computer, refrigerator, and more. Compared to the cost of outfitting your home with whole home surge protection, the value is clear. This entry was posted on Friday, December 7th, 2018 at 10:24 am. Both comments and pings are currently closed.